Not been out this week at all but used time to good effect – my pike pop-up sticks are all made and I’ve about 20 pike traces made up. Anyway, why have I not been out? Well, we’ve had some laminate flooring laid and that involved putting the tent up in the back garden and moving furniture from the areas that were to be done into there, getting the laminate ready for our installer, etc… and then getting the furniture restored into its usual location which went well until the final piece when, preparing to lift it, I had a big back twinge and froze in pain. Since then I’ve effectively been in recuperation and not really fit enough to hump weights of tackle around, etc… plus my niece is getting married this weekend and so needing to prep suits, haircuts, etc for that now. As October Looms An Old Man’s Thoughts Turn To Pike…. Yep, as it approaches the end of August it is time to start checking and preparing the pike tackle for the oncoming new pike season. Well, not a ‘pike season’ per se but for me I only pike fish between the 1st October until 31st March mainly for reasons of pike welfare… but that lies with me and my conscience and not incumbent on others. Also with the loss of the old coarse fishing close season (on stillwaters anyway) its nice to have an ‘event’ to look forward to. Anyway, this piece is regarding an item of my pike tackle that I find indispensable for legered baits and how to make your own – the pop-up strip. 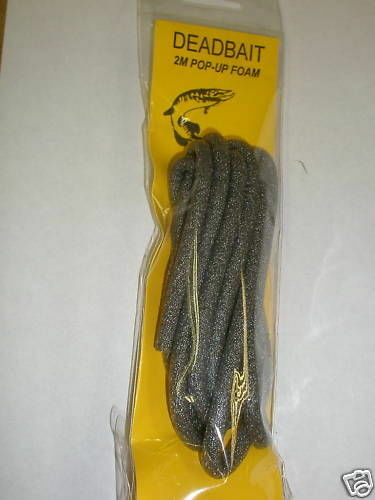 Basically the pop-up strip comprises a length of about 6” (depends on size of bait – needs to be just shorter than size of that) of closed-cell (ie does not soak in water and remains buoyant) polymer foam rod – usually of a flexible polyurethane material. It’s method of use is to insert into the mouth of your deadbait (well, if you tried it with a live bait (a) you are cruel and (b) you would then have a deadbait anyway) and pull through the body cavity to the tail end which makes the bait buoyant. You then add weight on the trace to sink the bait but placed the distance away that you want the bait to rise from the bottom. 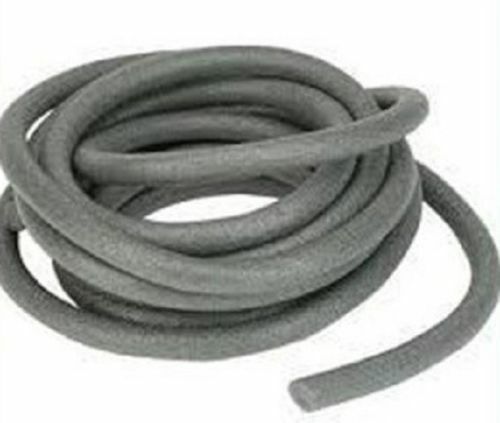 Or from a plumbers merchant or similar (called “Foam Sealant Joint Backer Rod” or suchlike) at around £2.50 for 10 metres (again liable to p&p if buying online but generally free if from eBay sources). Cut off a desired length of foam stick from the bulk length. Assuming 6” for this example – if using longer or shorter lengths then braid measurements following may need adjustment to suit). Double a 24” length the braid (ie end up with a 12” doubled length). Tie the doubled braid so a separated small loop is made at the end of the folded braid. So you should have now…. 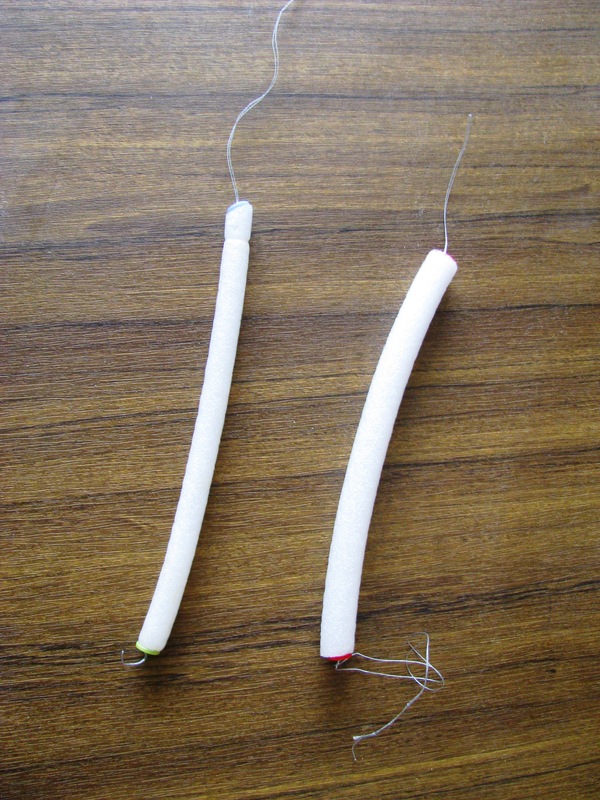 If using a mattress/doll needle then thread the two loose ends of the braid into the eye of the needle…if using a long baiting type needle then you will need to pass needle through the foam stick so that the eye/hook/barb protrudes from the end and catch the two loose braid ends. Push or pull the needle as appropriate through the foam so that the two loose ends are pulled through and are hanging free. Thread on another button to the loose ends and knot the braid loosely so that the button is held to the foam but no compressing it. Using the short loop and using a suitable baiting needle fed down from the tail, pull the foam strip into the mouth of the baitfish and up to the tail end of the fish until the loop appears at the tail and can be disconnected from the needle. You should now have possibly a short length of foam jutting from the bait’s mouth , don’t worry about that, the pike certainly don’t! 😀 And also the longer length of braid with the loop at the end. Add weight (suggest using 2SSG or 3SSG size shot) to either the braid or wire trace to sink the now buoyant bait at a point which will allow the bait to pop-up to the desired depth (usually 3”-6”). Buttons – are added to act as buffer when pulling the foam through the bait to prevent it getting compressed down, the ‘short loop’ button heading the way clears the path and the ‘long thread’ button prevents the braid cutting into the foam at the other end. 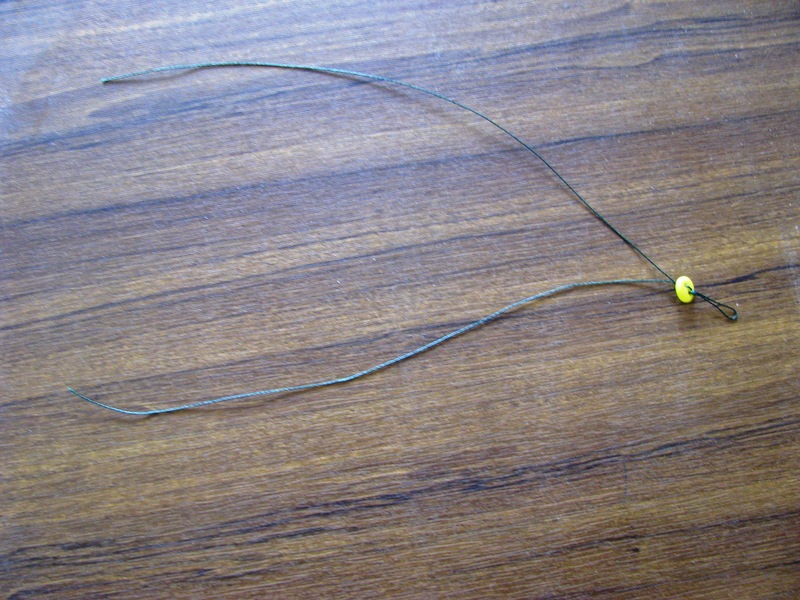 Long length braid + loop to wire trace – In the event of a pike taking the bait and spitting it out during play, or if the bait flies off accidentally on the cast then this system ensures that the foam is kept attached to the tackle and is retrieved so (a) you get to re-use it and (b) it doesn’t pollute the environment. Also if a pike so badly takes the bait that there is no option but to cut the trace away then it should still be possible to grab the braid and pull the foam free thus ensuring that this non-biodegradeable material is removed from the fishes digestive system where, left there, it could cause all sorts of problems. 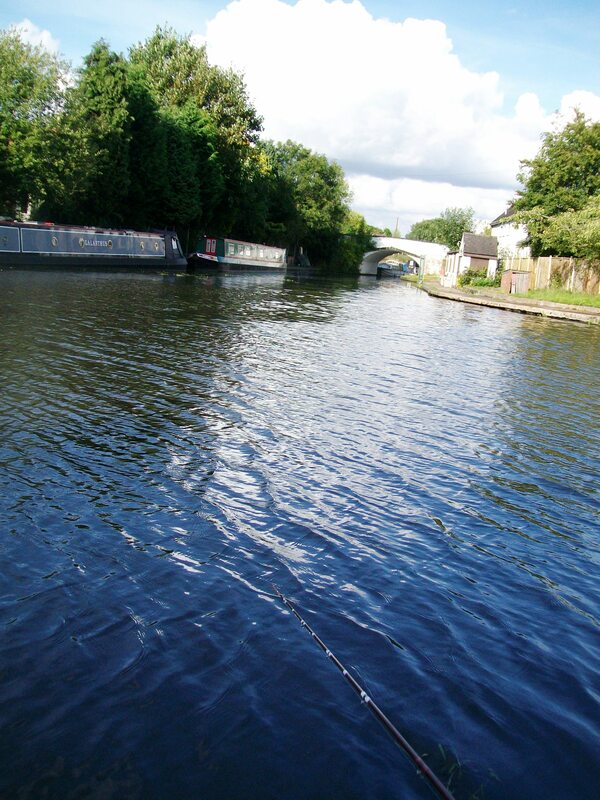 And the day being Saturday August 16th 2014 I headed out to a club pool I’d not fished for probably 12 months – and going out fishing on a Saturday is a rarity itself and that probably having last happened 2 years ago! Weekend fishing for me is usually avoided as that is when the water’s tend to get ‘busy’ with ‘the workers’ making use of their free time – and I, being retired, can pick and choose my moments :). In fact, if it wasn’t for the ‘crowding’ that would happen on the water banks I’d be campaigning for the government to make angling a government sponsored (£50,000 per annum with a minimum 35 hours per week spent at the waterside) activity/occupation – it well deserves to be! 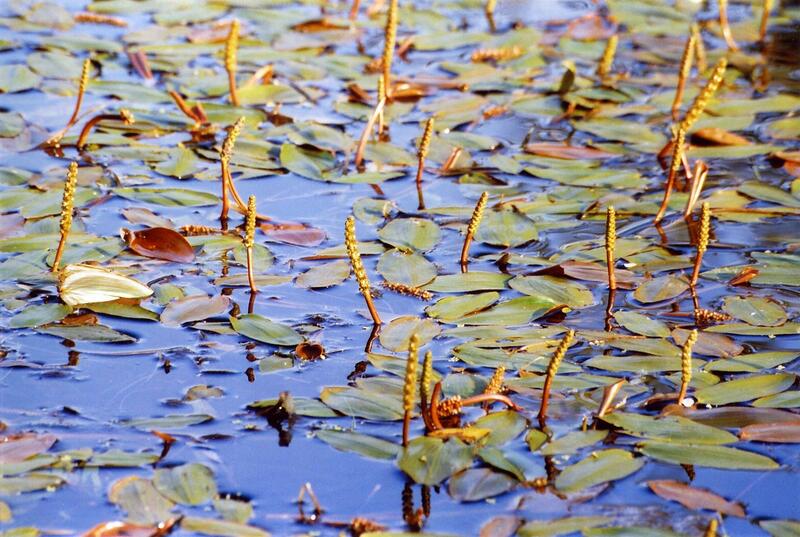 The main reason for the delayed return to the pool was that on the previous session there in the summer of 2013 I was inundated to the point of distraction by carp of 2-4oz constantly attacking the baits – usually grabbing legered baits as they fell and, if they reached the bottom, nibbling 14mm boilies to nothing with 10-15 minutes. And I left at the end of the day very frustrated. Anyway, I set off from home around 0630 – a little earlier than planned but the ‘V Festival’ takes place locally and I thought there may be traffic building up – but, in fact, there didn’t appear to be with the road running alongside the pool only busy to the usual degree… but more time to fish anyway!! I had intended to fish a different pool initially but to get there I’d have to pass across the main road ‘V’ site and I suspect traffic around there would be heavier. General topography of the bay is that the bay gently declines down from its marginal 3’ to the 11’ of the main body of the pool and as that approaches the dam wall it further falls to 20+’ deep. Intending to fish two rods – one with worm/maggot in the bay for perch which were there pre-water level drop and I was hoping with the return of the PN that the perch would return too, and the other rod with extra-hot chilli enhanced sausages into the main body for carp/bream – I baited up the bay swim with bread crumb mixed with dried blood, small halibut pellets and maggots and wetted with a blitzed prawns/mussels/tuna ‘ooze’ and the main body swim was baited up with a spomb loaded with a breadcrumb, maggots, chilli sausage pieces and small hemp pellets. Tackle for the day was the usual leger setup with 1.75lb TC rods, 8lb mainline, 8lb braid hooklengths with the ‘perch/bay’ rod with a size 12 hook, the other a size 6. In the video it all looks very calm and it was at the time but during the course of the day in wind freshened and was quite cooling – and although no rain actually fell where I was, it could be seen falling in several places in the distance – particularly over the Wrekin which seemed to be having a good dampening at one point. And at 1500 the breeze freshened further and seemed to hint at incoming rain so I packed up at that time, the other two anglers having left in the previous hour or so. In the end, there was no rain but the extra time at home was useful to effect a couple of tackle repairs/adjustments and to get baits put away, nets set to dry, etc. Bay rod… not one perch at all. 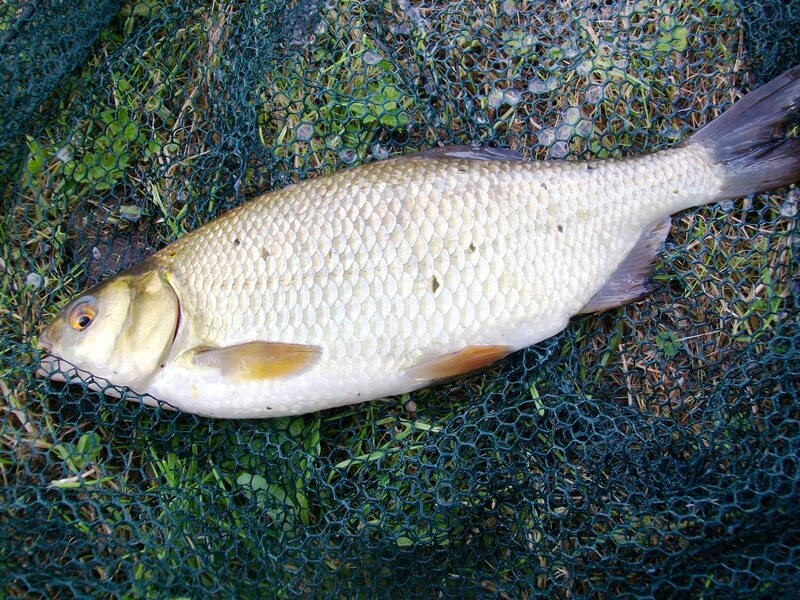 However, action was virtually constant the whole day long with small carp (mirror and common) of up to 4oz or so, roach of varying size to around 2-3oz and probably 10 small tench of same size as the roach. Also 3 larger carp were hooked with two of 4lb 3oz and 4lb 4oz landed but the third, which felt larger, got into submerged streamer type weed as it came towards the bank and managed to shed the hook. Well, I’m hoping to maybe get a few River Severn hours in on Tuesday but that depends… as we’re some work due to happen in the house on the weekend and need to prep the arrears to be dealt with which involves moving furniture, etc probably into the tent on the back lawn… and so need to pitch tent too… but fingers crossed it will all fall into place… I’ve not been on the river since last September but if not this week then should be the following one. 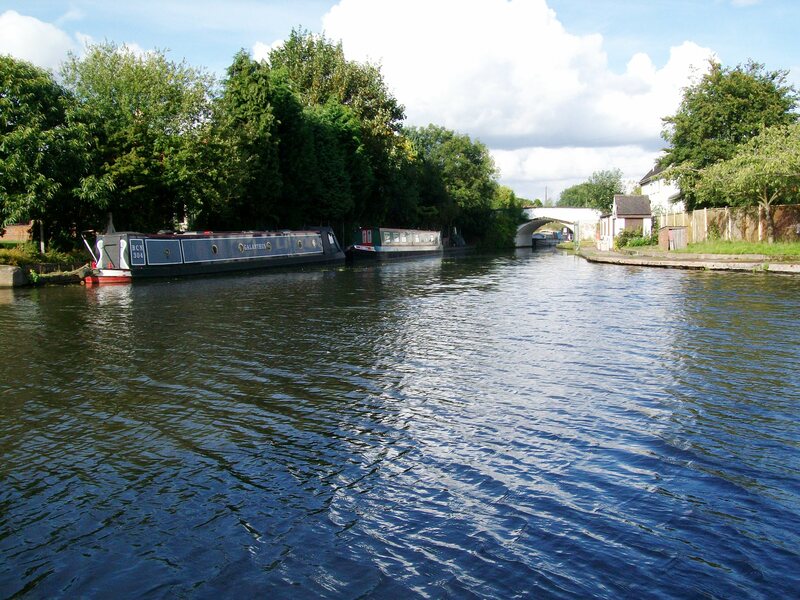 Thursday August 14th 2014 saw me heading to the Four Ashes stretch of the Staffs-Worcs canal at around 1530 arriving at my desired swim at around 1600. Initially I got out my depth sounder, not having fished this area before with a bait rod although I have lure fished and this swim is the one where I had my near 5lb pike from a few sessions ago. Depth sounding showed that, over by the concrete bank to the right, the depth was around 3.5’ slowly dropping to 4.5’ and then a sharper drop into the boat channel’s 5.5’ at around 8-10 yards out which after 4 yards or so started shallowing out again.. Depths from the line of the gap between the two houseboats to the left showed depths of 4’ dropping into the boat channel and shallowing out as the near bank was approached. So I decided to fish on the line of the gap between the boats and distance at about the 10 yard mark… the idea being that I’d be on the drop into the channel and could twitch the bait back in 10-15 minute intervals until bites were located. So location decided, I started baiting up with breadcrumb, particles and maggot before starting to tackle up. Walking down from the access point to the canal to the swim took about 10 minutes during in which time not a boat passed in either direction… and, you’ll have guessed, as soon as I started fishing, boats started passing by in both directions every 2-3 minutes for the first hour… so it was, basically, cast, retrieve, cast, retrieve, etc for that hour and although I had no fish I was getting plucks from time to time inter-boat which was encouraging. I ledger fished maggot, worm and maggot & worm baits on 6lb main line, 4” hooklength of 6lb braid and size 12 hook with a 1/2oz weight on a sliding link. 1900 and the traffic started to pick up again… seems that people had decided to stop for evening meal… and then trying to get an extra hour or so in before darkness started to fall. ….which was followed by 3 perch of a few ounces each. I had intended to fish until dark but the call of nature meant at around 1930 (probably an hour early) I had to give in after a 2 hour battle with the bladder and call it a day and look for a secluded area of plant life that required a warm nitrate/ammoniacal feed… as where I was fishing from was far from that with a marina, moored boats and houses overlooking my area – and the best cover available was probably a dock leaf thanks to the Canals & River Trust’s hooliganism actions and objectives to mow canal banksides into something approaching golf course greens. 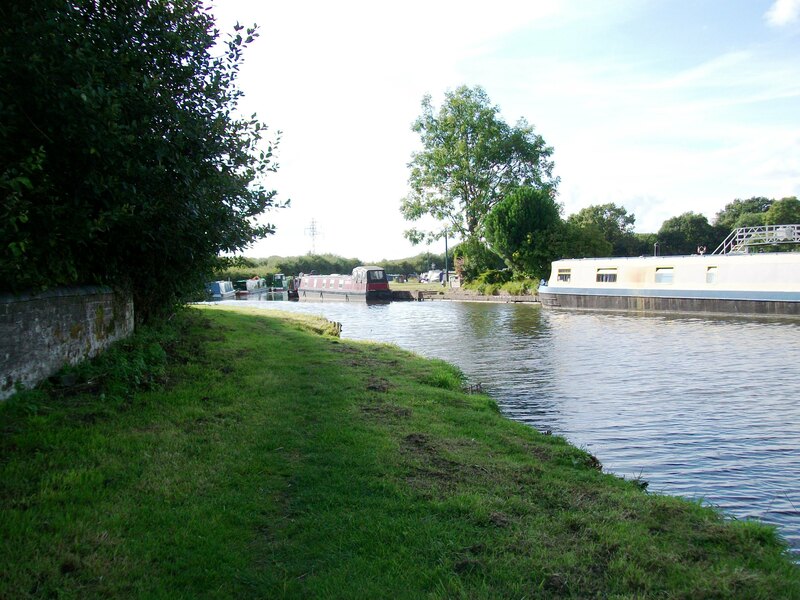 No need for that at all – just a 2’-3’ strip down the centre of the towpath for walking/bikers and the houseboat people are well capable of trampling down a yard or so on the edge of the bank to allow access to their boats. Just pure vandalism – and costs money in labour and machinery which are told we haven’t got for essentials like hospitals, etc. Makes you want to spit! Well I had several ideas in mind for tomorrow (Sat 16th) but one has been scotched by remembering the ‘V Festival’ is on nearby and so the roads to that destination will be mayhem with a capital ‘’M’…..
So… I’m now planning to visit a club pool I’ve not been to for probably 12 months or more. 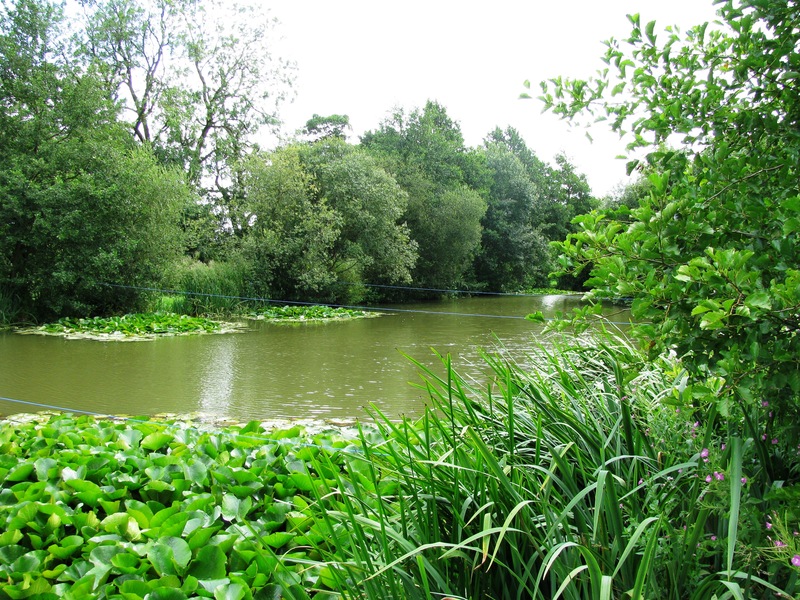 The last time I visited it I was plagued by 3-4oz carp taking the ledgered bait as it fell through the 11’ of water – and this was not just in one spot but EVERYWHERE I cast was the same from 1 rod length out to 50 yards or more, to the left or the right… and if a 14mm boilie made it to the bottom it was whittled away to nothing within 10-15 minutes max. Hence, I’ve never been back since but now I’ve thought to give it a try. My Tuesday morning session on the canal will now, from next week, be replaced with full day river sessions on the Severn until the end of September – come 1st October I generally switch my fishing at least 99% over to pike until the end of March although last winter was mild, pike didn’t seem to want to feed and the tench were still feeding at the end of November so I stuck with the tench until January when I started piking – and still hadn’t had one pike by the end of March 🙂 Anyway, as I’ve not been on the river at all yet in 2014 I’m going to have a few sessions there for the next few weeks. And, finally, there may be several blog postings appear simultaneously in the next couple of days… the reason being that last night a drunk driver went through a wall at the end of our street, across two gardens damaging a car parked on a drive… and then demolished the communications cabinet on the corner that provides our services. So at the moment we’ve no Virgin – landline phone, TV or internet – connection at all .. and probably be without for a couple of days as the cabling is repaired (between 2-4 vans down there at any one time working on it at the mo), then a new cabinet will have to be installed and Western Power will then need to attend to deal with reconnecting the power to the cabinet. SO… I’ve created this posting as a Word document and when services return I’ll transfer across to WordPress to be published… and so will probably appear along with others, and at least, tomorrow’s posting. 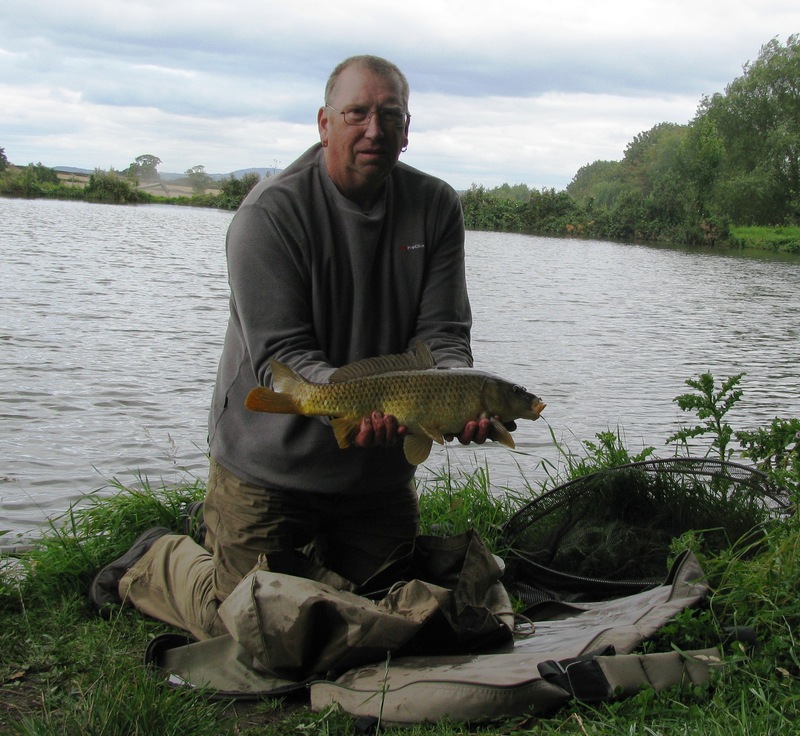 Tuesday August 12th 2014 and it was off to the club’s tench and silvers pool again in the hope that things would turn out better than the previous few visits when thing had seemed to slow down a bit. I arrived at the pool at around 0715 and I had fears that the ground may not have been passable due to the recent rains and that I may have needed to take the tackle by barrow from the car park at the near end of the pool to the far end where I intended to fish. However, those fears were quite unfounded and the ground was, in fact, quite firm and so I was able to drive straight up to peg 13. 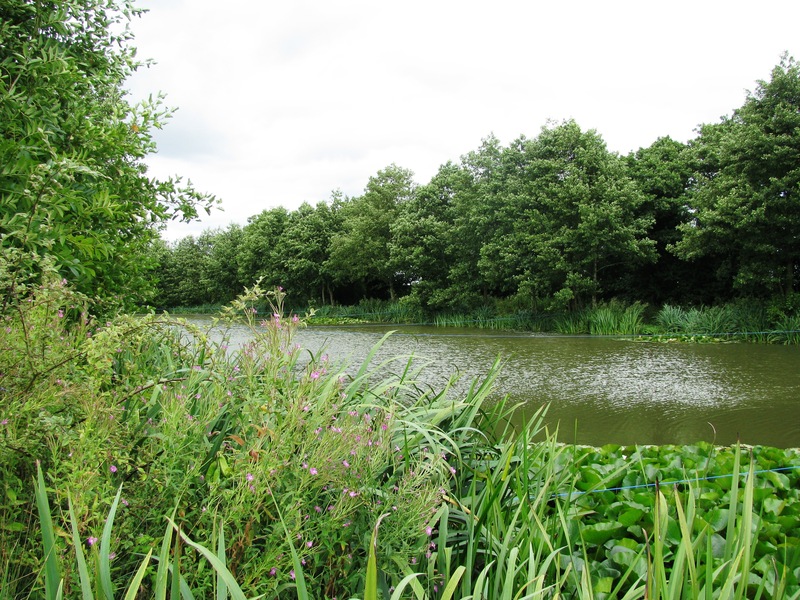 I walked round to peg 14 (from where the above photo was taken, looking back at 13) to have a look at that peg but I finally decided to fish from peg 13. The swim allowed access to a line parallel to the end of the island to the right and to the left to overhanging growth along the island’s edge. 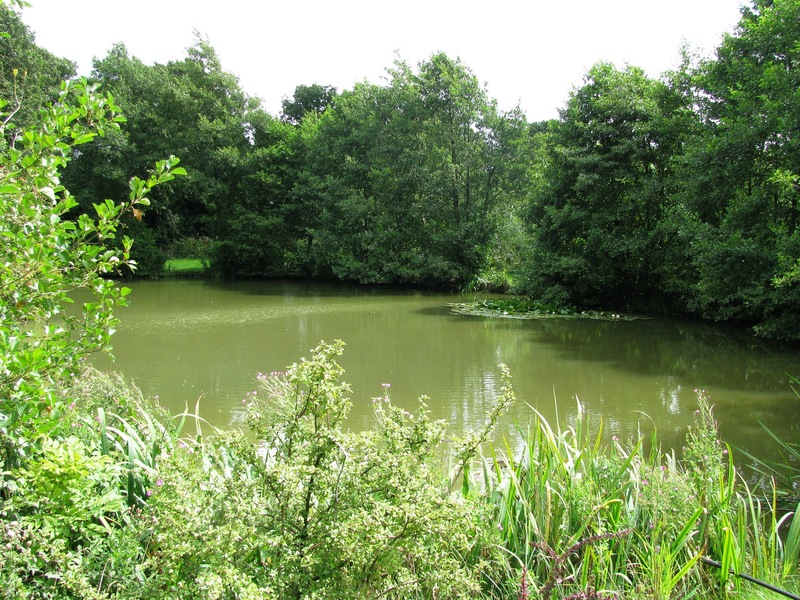 I baited two areas – just off the end of the island and the area near the overhanging vegetation – both with crumb, pellet, maggot, a few particles and mixed with hemp oil and sweetcorn blitz. I also catapulted small meat samples (small lengths of Webbox Cat Treat sticks and chilli coated sausage) into the end of island area. And both areas received regular small helpings of loose feed throughout the stay. Tackle consisted of my usual two leger set-ups – the left hand rod with a size 12 hook and fished with worm and maggot, the right hand rod with a size 6 hook with meat and later on, cheesepaste. Weather was a constant mixture of blue sky and then grey cloud intervals and although breezy the day was quite mild starting at around 12C and rising to 19C by the time I tackled down at 1400. 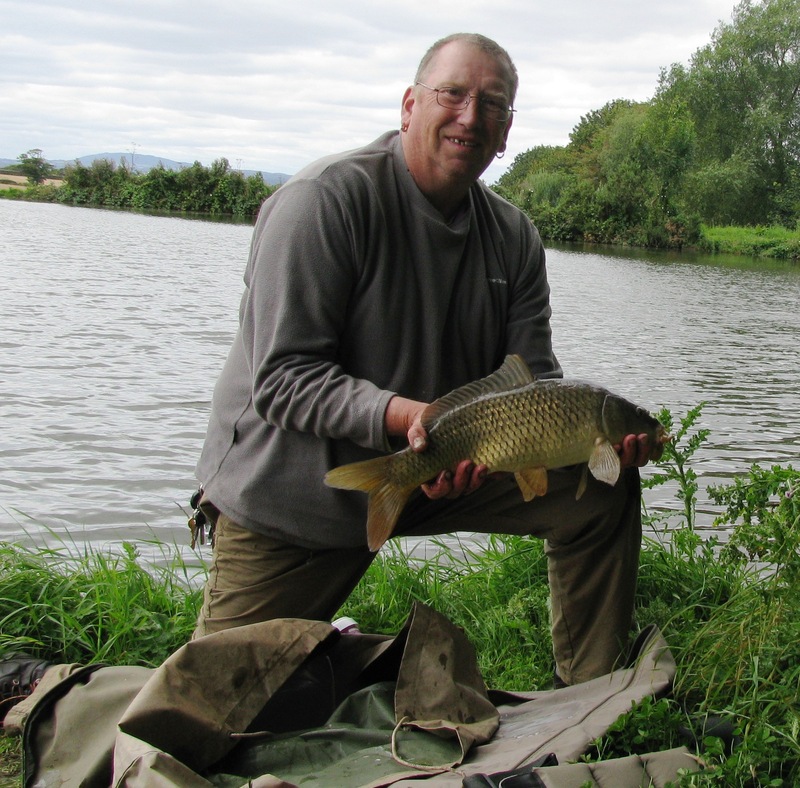 As to results, well, in the first hour I had two ‘mini’ runs – or possibly line bites – on the worm rod but other than that my new bite alarms on their debut outing had nothing else to do for the remaining five hours as I had not a further single nudge in all that time. The alarms (2 Nash S5R wireless heads, wireless receiver, carry case) were won in a draw-from-the-hat type competition with ‘Improve Your Coarse Fishing’ magazine back in April but I’ve only just received the full kit due to problems Nash has had with their supplier. Anyway, although they didn’t get an extensive testing they did seem to work quite well. Hopefully on the next trip they will see more action. 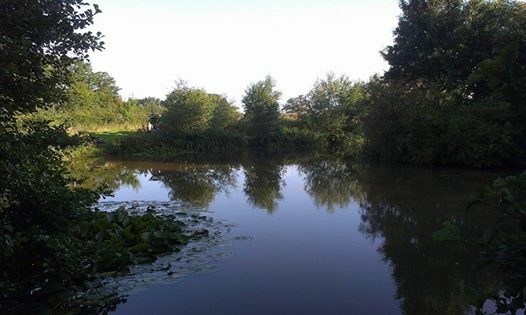 Monday August 4th 2014 at 0530 I revisited the Staffs-Worcs Canal at Four Ashes, starting at the central point and intending to walk with the spinning rod down the one length of canal using a blade spinner, switch to a Savage Gear Soft 4Play 9.5cm (Dirty Roach pattern) lure in a scull lip and walk back to the starting point and continue beyond up to the other limit of the stretch. The journey to end of the limit was quite eventful really – having at least 10 or more plucks and follows – follows mainly by small perch of 2-4oz … and landed another 2 perch slightly smaller than the first. I had a rest and my first cup of coffee of the day… I’d made my flask before going to bed so as to be able to get out as soon as possible and I’d not even made a coffee before leaving the house… and changed over to the Savage Gear lure as planned. However, I had planned to fish all my way back up but time was getting on – and I wanted to visit Aldi on the way home too – so I just cast into likely looking spots so that I could spend some time at the other limit which I suspected could house a pike or two – Mr Crabtree looking really. Anyway, on my walk up to the far limit none of my casts in the intervening waters elicited any response from perch or other species with nothing seen to follow or any plucks felt. So I finally arrived at my intended spot and made a few casts around the area – and then the line tightened and the water boiled and a fish was on – a good perch or a pike! But unfortunately, 15 seconds later there was that sickening feeling one gets when the line suddenly falls slack and the fish has gone. 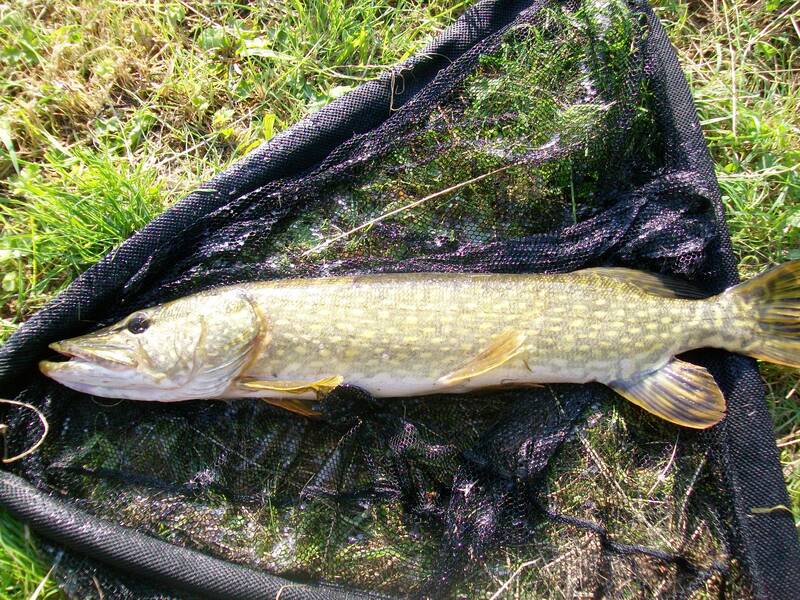 However, a few casts later and I was again into a ‘better’ fish – and this time I won the tussle and a 4lb 14oz pike was successfully landed. Shortly after this three boats almost together came through the area and with the leaves and debris kicked up fom the bottom attaching themselves to trace, lure and hooks I decided to call it a day and to head back to the car. I did have another few casts in likely spots en route back but had no further action – no plucks or follows – and eventually lost my lure to an underwater snag when I had to pull for a break and then just carried on back to the car and headed homewards. So I’ve done better pike-wise this year already than I did in the winter just passed when my tally was ZERO! I should point out that I normally do not fish for pike outside October-March, mainly due to health risks with pike in the warmer weather and their delicateness at such times.. and the landed pike was no exception requiring a good ten to fifteen minutes in the landing net with water fanned over it’s gills until it was strong enough to finally power away. However, in my defence I was actually perch fishing with a perch sized lure but hoping for a sign that pike were held up in that area… and now I’m happy re that and the info noted for later in the year… and happy that the pike was given a good restoral and swam away in full health. The other (lesser) factor for not pike fishing in the summer is that there are so many other species that can be sought – and I’d rather do that and switch to pike in the winter when the others become less active. Anyway, I mentioned earlier that I wanted to call in Aldi on the way home… the reason being that Aldi started a Fishing Special sale yesterday (Sunday 3rd) and they were supposed to have had some good looking fishing chairs in… However, when Liz and I visited yesterday there had been none delivered it seemed – and we checked 3 local Aldis with the same result… Hence this morning’s visit to see if they had arrived earlier today which it turns out they hadn’t – and won’t – for a time anyway. I spoke to the Aldi manager and the reason there were/are none on sale was that a fault in them was discovered before distribution and so they were withheld from sale. Just hoping that the problem gets resolved and the ‘modified/corrected’ items are brought out for sale again soon. Aldi actually does decent equipment (usually re-badged top name stuff) a lot cheaper than the originals (bags, clothing, etc) are good although things like rod/reel combos and packs of floats/spinners/hooks/line etc can be crud – the sort of thing your Aunt buys you for Christmas as she knows you go fishing – it’s just a matter of sorting the wheat from the chaff… anyway, the chairs looked solid enough in the paper brochure… but have been removed from the on-line version now. 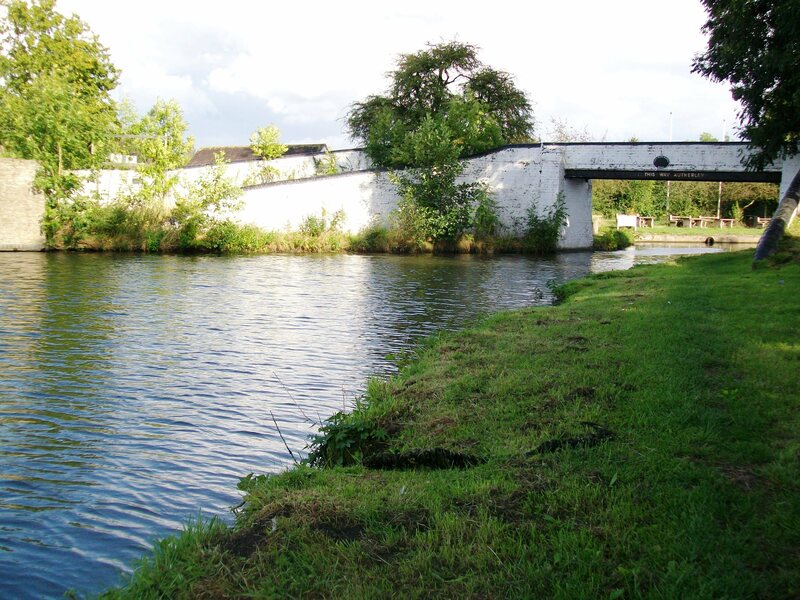 No more fishing this week now – visitors due at the weekend so time will be taken up with housework and shopping. Next trip possibly next Tuesday 12th… not sure where yet… possibly a Staffs-Worcs early morning session, possibly a day session on a pool.